Children are fascinated with bright colors and shiny objects. 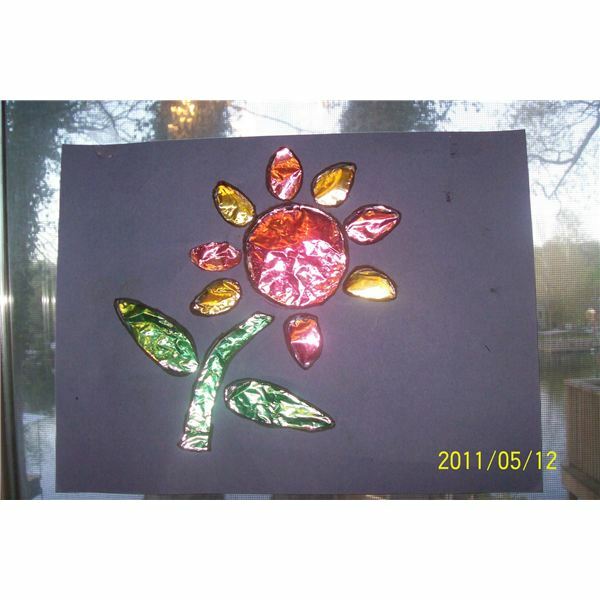 This foil flower stained glass spring art project for preschool would make a great Mother's Day gift. The teacher will trace around a flower stencil and cut a flower out of blue or black construction paper. 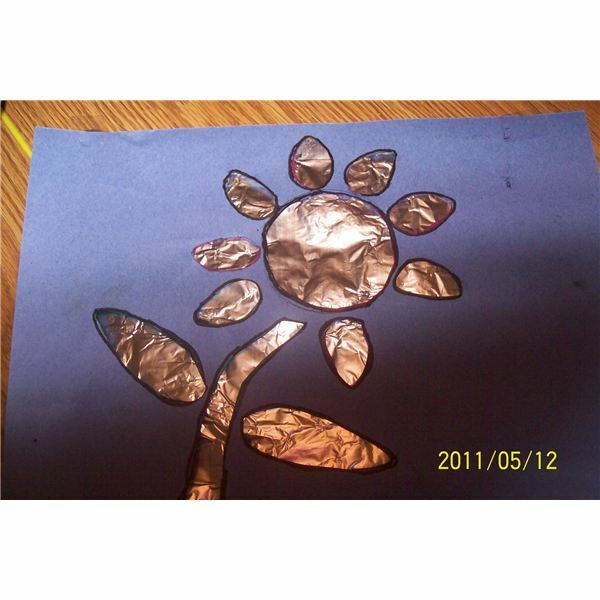 The teacher will measure and cut a piece of aluminum foil and glue it to back of the flower opening on the construction paper. Outline the picture with a black marker. The students will color the foil with markers. When the foil flowers are finished they will shimmer and shine like stained glass. There are so many wonderful egg art projects to do with your preschoolers. The stained glass egg project below is easy and beautiful. 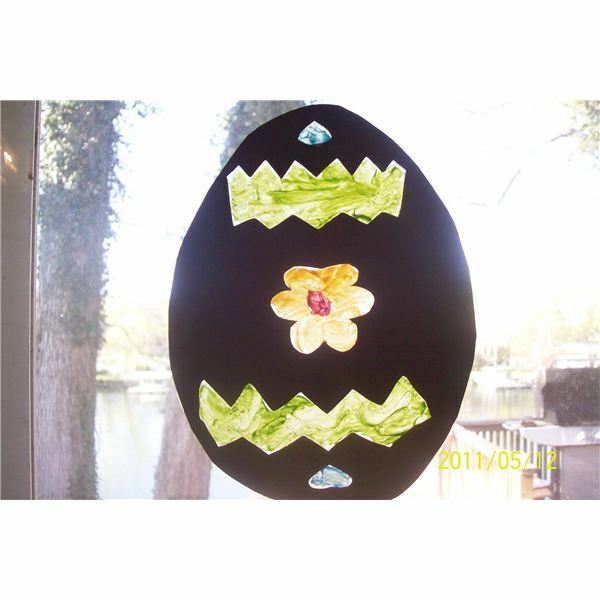 There are several different ways to make this stained glass egg project. The teacher will cut an egg shape out of black construction paper. The children can draw designs on the egg with a pencil and the teacher will cut them out or the teacher can have a pre-made design already cut out. 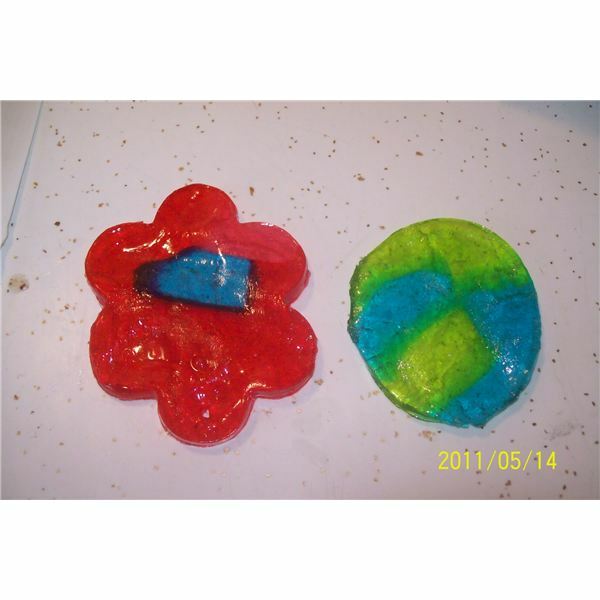 The children can then glue tissue paper or colored cellophane over the holes to create a perfect stained glass effect. For an easier option the teacher can place waxed paper on the back of the egg and let the children paint through the holes with fluorescent paint. The picture above has been created with waxed paper and fluorescent paint. Kids will love making this yummy, edible, stained glass spring art project for preschool. Children love eating what they have created so they will enjoy this stained glass craft. The teacher will place aluminum foil that has been sprayed with cooking spray on a cookie sheet. The students will choose which spring cutters they wish to use for their stained glass craft. The teacher will arrange the cookie cutters on the baking sheet. 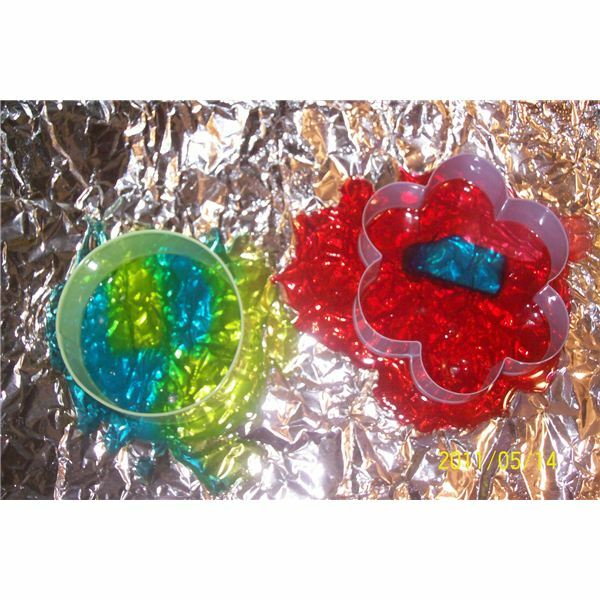 The students will place different colors of Jolly Ranchers in their cookie cutters. Teacher will bake these in the oven at 350 degrees for about 10 minutes or until melted. The teacher will make a hole in the hot candy so she can insert fishing line or yarn to hang the finished project. Remove the candy from the cookie cutters, insert fishing line, and hang. This butterfly stained glass spring art project for preschoolers can be made into a variety of gifts for Mother's or Father's Day. 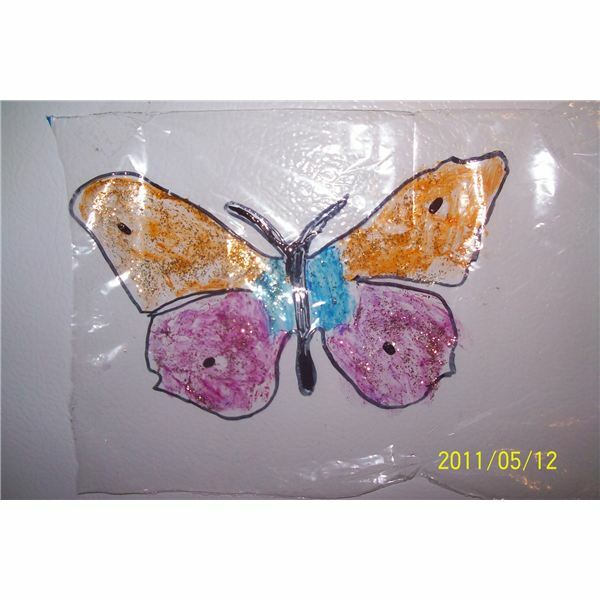 The teacher will draw a butterfly onto a Ziploc bag with a black permanent marker. The children will use markers to color the butterfly. The students will then take gold glitter glue and rub over their butterfly. 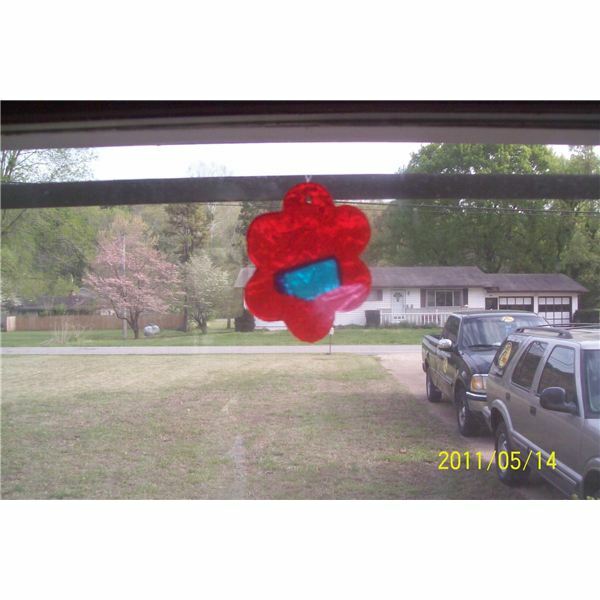 These can be taped to a window or the teacher can cut the butterfly out and glue it to a plastic picture frame or plastic vase for a Mother's or Father's Day stained glass gift. Note: Make sure the children wash their hands thoroughly to prevent glitter getting into the eyes. Glitter can cause eye irritation.